Veal is one of those meats that even meat-eaters sometimes refuse to touch, and for a good reason: it’s associated with some pretty horrifying animal husbandry. If you’re buying veal from the grocery store, you’re probably justified in avoiding it, but if you can get it from a farmer, there is such a thing as ethically-produced veal (get more details here). If you’re lucky enough to have access to humanely raised veal, this is a great way to make the most of it. 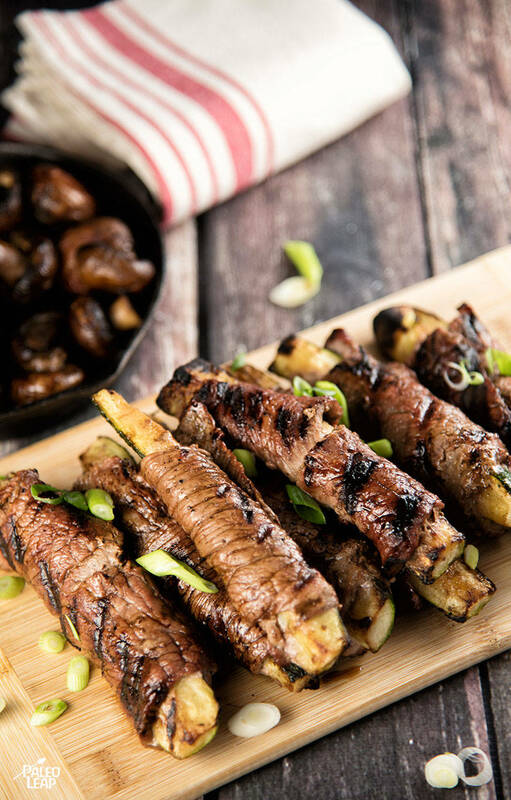 Grilling keeps the meat tender, and wrapping the scallops around grilled zucchini quarters gives the zucchini a richer flavor as well. You don’t need a lot of spices that overwhelm the flavor of the actual food; garlic, olive oil, and vinegar is plenty to make it taste good. And it definitely looks impressive on the plate! Grill up some more zucchini to serve with these, or branch out into other vegetables for a tasty grilled salad. Using a meat mallet, flatten the veal scallops. Season the zucchini with garlic powder, salt, and pepper. Grill the zucchini on each side for about 2 minutes. Remove the zucchini from grill. Roll the veal tightly around each zucchini quarter. Brush the veal rolls with the oil-vinegar mixture and grill for 2 to 3 minutes per side.